Tile and grout really can make or break the interior of a home, office, or commercial space. It really adds character to any room that it is in, and brings a lot of color too. One thing you do not want to do is neglect your tile work and let it get dirty. This will really take away from its appeal, which is why it was installed in the first place. When you notice it is time to clean your tile and grout, let The Woodlands carpet cleaning do it for you. We are fast and efficient, with a knowledgeable staff. More often than not tile is located where water is in use. Wherever there is water there is mineral build up, and the risk of attracting mold. The grout in between your tile is really good at trapping moisture within. This moisture will in turn attract mold. Mold will start to discolor your tile and grout, and even slowly break things down if not addressed quickly. Carpet cleaners in The Woodlands, TX is no stranger to mold damage. We have powerful steam extractors and products that will cut through the mold and grime quickly and easily. A great way to keep mold at bay is to dry off your tile if at all possible. This can be hard if it is located in a shower because there is almost always standing water that is in contact with your tile. If this is the case then it is in your best interest to clean it yourself when you notice discoloration or odd odors. Once things get out of hand then we can come in and steam everything to get that deep clean that is really needed. Minerals in your water can build up and cause a scaly pale appearance to your tile and grout. There is really no way to prevent this from happening. Vinegar is a great all natural solvent that can dissolve the hard water off of your tile and grout. It might get to a point where this will not work and you will need the big guns and that is where carpet cleaning in The Woodlands, TX comes in. 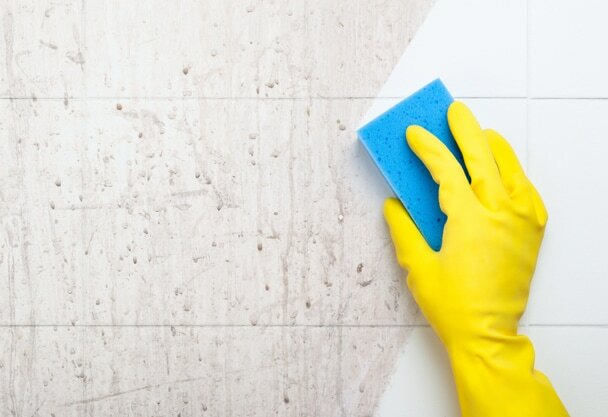 It will really become evident what professional cleaning equipment can do on tile and grout when we are done cleaning your home, office, or commercial space. Tile and grout can be present in businesses as well. Generally they would be in a bathroom, but all businesses are different. As always it is important to maintain every element in your business or commercial space. The last thing you want to do is scare away potential or existing clients with a poorly looked after business. People really do notice the cleanliness of their surroundings, and they will definitely notice how clean your business is too. Carpet cleaners in The Woodlands Texas has been dedicated to providing quality services in our community since we started this company. There is no better feeling than providing the best service possible, and seeing the smiles on our customers’ faces when we are done working for them. We always take your needs seriously and aim to please. Do not waste your time on a company that does not care and give us a call for any of your tile and grout cleaning needs at (832) 791-4210. Around Victoria Glen Dr, Conroe you can reach our Office for just 12 minutes car ride.